Weekend Enjoyment – A brother with Autism. Autism – 2003 Danish Study on Mercury Fabricated? Vaccinations andGMO’s? “Bought” Asks & Answers this Question and Uncovers the Hidden Facts about dangerous vaccinations and a food supply chain contaminated by the use of GMO’s. Autism – Well, what do any of us know? Beth Clay is the present Senior Vice President of Capitol Strategy Consultants in Washington DC, where she works with corporate and nonprofit organizations and government relations. Much of her work is focused now on dietary supplement regulation and alternative health policy issues, particularly regarding vaccination and autism. Formerly she was a senior on the House Committee on Oversight and Government Reform and the Subcommittee on Human Rights and Wellness with Chairman Congressman Dan Burton. It was her work with Rep. Burton’s investigation into CDC failures over mercury in vaccines leading to autism that has made her best known. She has also worked with the NIH’s Office of Alternative Medicine, and was a member of the US delegation to Codex Alimentarius’ Committee on Nutrition and Food for Special Dietary Uses. Emily Tarsell is the mother of 21 year old Christina Tarsell who died suddenly following her third injection with the human papilloma virus (HPV) vaccine. She is a licensed clinical counselor and is now the volunteer Director of the Gardasil Network Development group at Barbara Lo Fisher’s National Vaccine Information Center and doing out reach to families who have experienced the loss of a daughter or have suffered serious adverse events from the HPV vaccine. The Internet is Causing the Autism Epidemic? & Dismissed! The McGlynn: Verification of the facts concerning Paul Thorsen as the scientist involved in a potential fraud has now been confirmed by various news sources. Who’s Afraid Of The Truth About Autism? Autism & Vaccines Is there a link??? Autism – Press Complaints Commission Orders Sunday Times to Remove MMR Journalist’s Stories on Dr. Wakefield from Paper’s Web Site. On Tuesday, the Federal Government’s leading immunization advisory panel unanimously approved a sweeping list of vaccine safety research recommendations for the US Department of Health and Human Services, including several that are directly or indirectly linked to the vaccine-autism debate. The endorsement, from the highly influential National Vaccine Advisory Committee, will surely intensify the argument. Recently, I was amazed to hear a commentary by CNN’s Campbell Brown on the controversial vaccine issue. After a ruling by the ‘special vaccine court’ saying the Measles, Mumps, Rubella shot wasn’t found to be responsible for the plaintiffs’ autism, she and others in the media began making assertions that the judgment was in, and vaccines had been proven safe. No one would be more relieved than Jenny and I if that were true. But with all due respect to Ms. Brown, a ruling against causation in three cases out of more than 5000 hardly proves that other children won’t be adversely affected by the MMR, let alone that all vaccines are safe. This is a huge leap of logic by anyone’s standards. Not everyone gets cancer from smoking, but cigarettes do cause cancer. After 100 years and many rulings in favor of the tobacco companies, we finally figured that out. The truth is that no one without a vested interest in the profitability of vaccines has studied all 36 of them in depth. There are more than 100 vaccines in development, and no tests for cumulative effect or vaccine interaction of all 36 vaccines in the current schedule have ever been done. If I’m mistaken, I challenge those who are making such grand pronouncements about vaccine safety to produce those studies. In this growing crisis, we cannot afford to blindly trumpet the agenda of the CDC, the American Academy of Pediatrics (AAP) or vaccine makers. Now more than ever, we must resist the urge to close this book before it’s been written. The anecdotal evidence of millions of parents who’ve seen their totally normal kids regress into sickness and mental isolation after a trip to the pediatrician’s office must be seriously considered. The legitimate concern they and many in the scientific community have that environmental toxins, including those found in vaccines, may be causing autism and other disorders (Aspergers, ADD, ADHD), cannot be dissuaded by a show of sympathy and a friendly invitation to look for the ‘real’ cause of autism anywhere but within the lucrative vaccine program. With vaccines being the fastest growing division of the pharmaceutical industry, isn’t it possible that profits may play a part in the decision-making? That the vaccine program is becoming more of a profit engine than a means of prevention? In a world left reeling from the catastrophic effects of greed, mismanagement and corporate insensitivity, is it so absurd for us to wonder why American children are being given twice as many vaccines on average, compared to the top 30 first world countries? It has become clear over the course of this investigation that the VRBPAC and the ACIP [the two main advisory boards that determine the vaccine schedule] are dominated by individuals with close working relationships with the vaccine producers. This was never the intent of the Federal Advisory Committee Act, which requires that a diversity of views be represented on advisory committees. Isn’t that enough to raise questions about the process of choosing the vaccine schedule? With many states like Minnesota now reporting the number at 1 in 80 children affected with autism, can we afford to trust those who serve two masters or their logic that tells us “one size fits all” when it comes to vaccines? Can we afford to ignore vaccines as a possible cause of these rising numbers when they are one of the fastest growing elements in our children’s environment? With all the doubt that’s left hanging on this topic, how can anyone in the media or medical profession, boldly demand that all parents march out and give their kids 36 of these shots, six at a time in dosage levels equal to that given a 200 pound man? This is a bias of the most dangerous kind. We have never argued that people shouldn’t be immunized for the most serious threats including measles and polio, but surely there’s a limit as to how many viruses and toxins can be introduced into the body of a small child. Veterinarians found out years ago that in many cases they were over-immunizing our pets, a syndrome they call Vaccinosis. It overwhelmed the immune system of the animals, causing myriad physical and neurological disorders. Sound familiar? If you can over-immunize a dog, is it so far out to assume that you can over-immunize a child? These forward thinking vets also decided to remove thimerosal from animal vaccines in 1992, and yet this substance, which is 49% mercury, is still in human vaccines. Don’t our children deserve as much consideration as our pets? Listen to the patients and the patients will teach…I think there is an inexcusable issue, and that’s the lack of research that’s been done here…A parent can legitimately question giving a one-day old baby, or a two-day old baby [the] Hepatitis B vaccine that has no risk for it [and] the mother has no risk for it. That’s a heavy-duty vaccine given on day two [of life]. I think those are legitimate questions. The CDC cannot afford to admit thimerosal is toxic because they have been promoting it for several years…If they would have followed through with our 1982 report, vaccines would have been freed of thimerosal and all this autism as they tell me would not have occurred. But as it is, it all occurred. If the CDC, the AAP and Ms. Brown insist that our children take twice as many shots as the rest of the western world, we need more independent vaccine research not done by the drug companies selling the vaccines or by organizations under their influence. Studies that cannot be internally suppressed. Answers parents can trust. Perhaps this is what Campbell Brown should be demanding and how the power of the press could better serve the public in the future. MINNEAPOLIS – Ayub Abdi is a cute 5-year-old with a smile that might be called shy if not for the empty look in his eyes. He does not speak. When he was 2, he could say “Dad,” “Mom,” “give me” and “need water,” but he has lost all that. In an effort to find out, the Minnesota Department of Health is conducting an epidemiological survey in consultation with the federal Centers for Disease Control and Prevention. This kind of conundrum, experts say, arises whenever there is a cluster of noncontagious illnesses. While there is little research on autism clusters, reports of cancer clusters are so common that health agencies across the country respond to more than 1,000 inquiries about suspected ones each year. A vast majority prove unfounded, and even when one is confirmed, the cause is seldom ascertained, as it was for Kaposi’s sarcoma among gay men and mesothelioma among asbestos workers. It is “extraordinarily difficult” to separate chance clusters from those in which everyone was exposed to the same carcinogen, said Dr. Michael J. Thun, the American Cancer Society’s vice president for epidemiology. Since the cause of autism is unknown, the authorities in Minnesota say it is hard to know even what to investigate. “There are obviously some real concerns here, but we don’t want to make a cursory judgment,” said Buddy Ferguson, a health department spokesman. Even counting autism cases is difficult because the diagnoses are first made by the schools, not doctors, and population estimates for Somalis vary widely. Results are expected late this month. Even if the department confirms that a cluster exists, it will not answer the question why. Still, Dr. Thun said a possible focus in one ethnic group “increases my sense that investigating it is essential.” The next step, he added, would be to look at Somalis in other cities. A small recent study of refugees in schools in Stockholm found that Somalis were in classes for autistic children at three times the normal rate. Calls to representatives of Somali groups in Seattle and San Diego found that they were aware of the fear in Minneapolis but unsure about their own rates. Doctors familiar with the Somali communities in Boston and Lewiston, Me., had heard of no surges there. “It’s a concern here, but we haven’t done anything to look specifically,” said Ahmed Salim of Somali Family Services in San Diego. Shamso Yusuf of the Refugee Women’s Alliance in Seattle said tearfully that her own daughter had been given a diagnosis of autism, “and I see a lot of parents who have 5-year-olds who cannot speak.” But no Seattle study has been done, she said. Somalis began arriving in Minneapolis in 1993, driven out by civil war; now their population in Minnesota is estimated at 30,000 to 60,000. The city is welcoming and social benefits are generous, but many live a life apart as conservative Muslims, the women in head scarves and long dresses. Many Somali men have jobs as taxi drivers or security guards; others are accountants or run shops in the mini-malls catering to Somalis. Antivaccine activists are campaigning among them, which worries public health officials, especially because some families go back and forth to Somalia, where measles is still a significant cause of childhood death, according to Unicef. Dr. Daniel S. McLellan, a pediatrician, said that when he began practicing at Children’s Hospital six years ago, he was struck by how many autistic Somali children he saw. But each theory has weaknesses. Most of the children, said Idil Abdull, one of the first mothers of an autistic child to ask the authorities to investigate, were born here and have had the same medical care and shots as any child on Medicaid. It is not a case of misdiagnosis because of language problems; many have siblings doing well in school. The Hmong, from Southeast Asia, who also immigrated here through refugee camps, do not have high autism rates, Ms. Harrington said. Somali refugees have many illnesses, said Dr. Osman M. Ahmed of the East Africa Health Project in St. Paul, including tuberculosis, hepatitis B, depression from the civil war, and vitamin D deficiencies. But lack of vitamin D is a dubious explanation. Rates of the disorder are similar among black and white Americans, according to the C.D.C., and Somalis, on average, are no darker-skinned than black Americans. In any case, many Somali parents are baffled and scared. Many Somali parents here do not read English or watch American television, he said, so they first hear of autism only when a pediatrician suggests testing a child. Some send their children back to relatives in Somalia. He warned them not to trust the state health department and suggested they slow down their children’s shots and get exemptions to school vaccination requirements. He also offered to pay for some to attend an antivaccine conference. The appeal has had an effect. Many parents, including Ayub’s, now say that their children’s autism began after seizures that started after they got shots. “People in the Somali community have gravitated to that theory, and many are resisting immunization,” Dr. McLellan said. But there are also children like 8-year-old Shumsudin Warsame, who does not speak more than one word at a time, runs in circles and hurts himself jabbing pens into his face. He was born in Somalia, grew up in Egypt and arrived here six months ago. He started having seizures before he was a year old, his father, Abdiasis, said, long before he had any vaccinations. To Mr. Warsame, finding something to blame is beside the point. He is a single parent, and he and Shumsudin were at a health center hoping to find a part-time home care aide. On February 12, the federal “Vaccine Court” in Washington issued a sweeping ruling in three highly touted “test cases” against families who claimed that their childrens’ autism had been caused by vaccines. The Special Masters in those three cases found that Petitioners failed to establish causation between MMR vaccines, the mercury-laced vaccine preservative thimerosal, and autism (the court decision, which is under appeal, deferred any finding on a thimerosal-only theory of causation). The rulings could have a significant precedential impact on some 5,000 families who opted to bring their cases in the Omnibus Autism Proceedings (OAP) hoping that the vaccine court would officially hold that the MMR vaccine or thimerosal had caused autism in their children. The New York Times joined the government Health Agency (HRSA) and its big pharma allies hailing the decisions as proof that the scientific doubts about vaccine safety had finally been “demolished.” The US Department of Health and Human services said the rulings should “help reassure parents that vaccines do not cause autism.” The Times, which has made itself a blind mouthpiece for HRSA and a leading defender of vaccine safety, joined crowing government and vaccine industry flacks applauding the decisions like giddy cheerleaders, rooting for the same court that many of these same voices viscously derided just one year ago, after Hannah Poling won compensation for her vaccine induced autism. But last week, the parents of yet another child with autism spectrum disorder (ASD) were awarded a lump sum of more than $810,000 (plus an estimated $30-40,000 per year for autism services and care) in compensation by the Court, which ruled that the measels-mumps-rubella (MMR) vaccine had caused acute brain damage that led to his autism spectrum disorder. Bailey’s diagnosis is Pervasive Developmental Disorder — Not Otherwise Specified (PDD-NOS) which has been recognized as an autism spectrum disorder by CDC, HRSA and the other federal health agencies since at least the 1990s. The Court found that Bailey’s ADEM was both caused-in-fact and proximately caused by his vaccination. It is well-understood that the vaccination at issue can cause ADEM, and the Court found, based upon a full reading and hearing of the pertinent facts in this case, that it did actually cause the ADEM. Furthermore, Bailey’s ADEM was severe enough to cause lasting, residual damage, and retarded his developmental progress, which fits under the generalized heading of Pervasive Developmental Delay, or PDD [an autism spectrum disorder]. The Court found that Bailey would not have suffered this delay but for the administration of the MMR vaccine, and that this chain of causation was… a proximate sequence of cause and effect leading inexorably from vaccination to Pervasive Developmental Delay. The Bailey decision is not an isolated ruling. We now know of at least two other successful ADEM cases argued in Vaccine Court. More significantly, an explosive investigation by CBS News has found that since 1988, the vaccine court has awarded money judgments, often in the millions of dollars, to thirteen hundred and twenty two families whose children suffered brain damage from vaccines. In many of these cases, the government paid out awards following a judicial finding that vaccine injury lead to the child’s autism spectrum disorder. In each of these cases, the plaintiffs’ attorneys made the same tactical decision made by Bailey Bank’s lawyer, electing to opt out of the highly charged Omnibus Autism Proceedings and argue their autism cases in the regular vaccine court. In many other successful cases, attorneys elected to steer clear of the hot button autism issue altogether and seek recovery instead for the underlying brain damage that caused their client’s autism. Medical records associated with these proceedings clearly tell the tale. In perhaps hundreds of these cases, the children have all the classic symptoms of regressive autism; following vaccination a perfectly healthy child experiences high fever, seizures, and other illnesses, then gradually, over about three months, loses language, the ability to make eye contact, becomes “over-focused” and engages in stereotypical head banging and screaming and then suffers developmental delays characteristic of autism. Many of these children had received the autism diagnosis. Yet the radioactive word “autism” appears nowhere in the decision. Instead the vaccine court Special Masters rest their judgments on their finding that the vaccines caused some generalized brain injury, mainly Encephalopathy/encephalitis (brain inflammation) or “seizure disorders” — conditions known to cause autism-like symptoms. A large number of the children who have won these judgments have been separately diagnosed with autism. HRSA acknowledged this fact in a recent letter, but told us it does not keep data on how many of these children were autistic. Vaccine Court judges are equipped with a draconian armory of weapons deployable against plaintiffs intent on proving the causal connection between vaccines and autism. Jury trials are prohibited. Damages are capped; awards for pain and suffering are strictly limited and punitive damages banned altogether. Vaccine defenders have an army of Department of Justice attorneys with virtually unlimited resources for expert witnesses and other litigation costs. Plaintiffs, in contrast, must fund the up front costs for experts on their own. In a cultural choice that clearly favors defendants, vaccine court gives overwhelming weight to written medical records which are often inaccurate — over all other forms of testimony and evidence. Observations by parents and other caretakers are given little weight. Worst of all — plaintiffs have no right to discovery either against the pharmaceutical industry or the government. Since autism is a behavioral affliction rather than a precisely defined biological injury — epidemiological studies are critical to establishing its causation. But the greatest source of epidemiological data is the Vaccine Safety Datalink (VSD) — the government maintained medical records of hundreds of thousands of vaccinated children — which HHS has gone to great lengths to keep out of the hands of plaintiffs’ attorneys and independent scientists. Unfortunately the vaccine court has judicially anointed this corrupt concealment by consistently denying every motion by petitioners to view the VSD. The raw data collected in the VSD would undoubtedly provide the epidemiological evidence needed to understand the relationship between vaccines and autism. The absence of such studies makes it easy for judges to say to plaintiffs they have not met their burden of proving causation. Meanwhile, CDC has actively, openly and systematically suppressed and defunded epidemiological studies that might establish a causal link. CDC has ignored repeated pleadings that it fund peer reviewed studies of unvaccinated American cohorts like the Amish and home-schooled children. At the same time the agency has worked overtime ginning up a series of fatally-flawed European studies purporting to dispute the link. Even a cursory critical examination reveals that the oft-cited Danish, English, and Italian studies are rank tobacco science. Many of them were funded by CDC, a badly compromised agency, performed by vaccine industry scientists, and published in miserably conflicted journals. Needless to say, the existence of these phony studies, combined with the deliberate dearth of epidemiological evidence makes it easy for the special masters to dodge a politically explosive finding by holding that there is “insufficient evidence.”………………………………………. A NEW THEORY OF AUTISM CAUSATION? 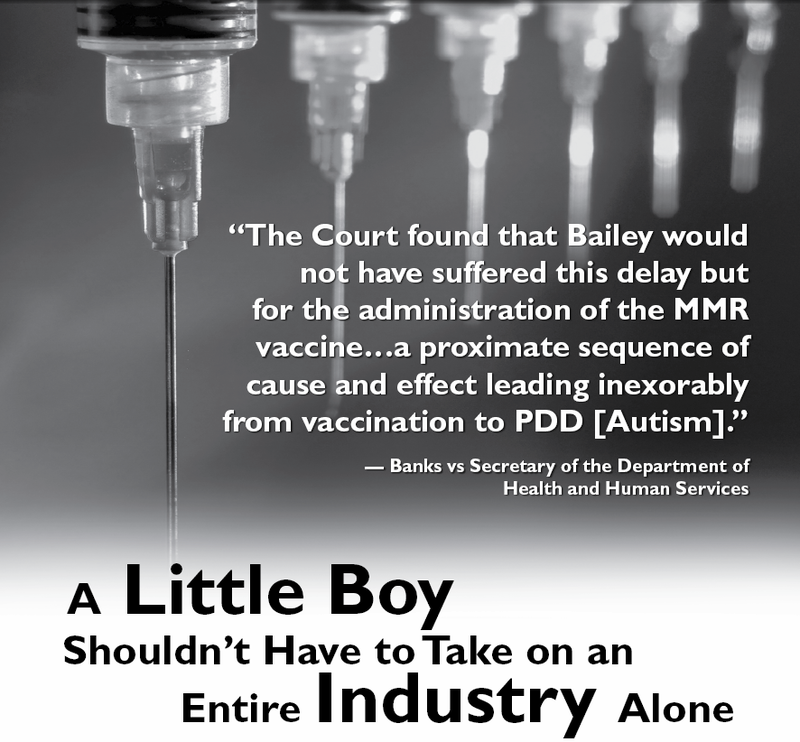 A ruling from Federal Vaccine Court — that MMR vaccine caused an autism spectrum disorder in a young boy named Bailey Banks — flies directly in the face of the triple-play decision against a vaccine-autism link issued by the Court on February 12. The Special Masters in those three cases inferred that the vaccine-autism theory was the stuff of Alice in Wonderland fantasy, and virtually accused the childrens’ physicians of medical malpractice. (CNN’s Dr. Sanjay Gupta called the Court’s language “snide,” and we agree). Meanwhile, the US Department of Health and Human services said the rulings should “help reassure parents that vaccines do not cause autism.” But why should parents feel reassured when two out of five autism cases (40%) – that we know of – have won taxpayer-funded compensation in Vaccine Court? In his decision, Special Master Abell ruled that the MMR vaccine produced a side effect in Bailey called acute disseminated encephalomyelitis (ADEM). ADEM is a neurological disorder characterized by inflammation of the brain and spinal cord. The disorder results in damage to the myelin sheath, a fatty coating that insulates nerve fibers in the brain. ADEM can be caused by natural infections, especially from the measles virus. But it also is a recognized post-vaccination injury, especially from vaccines for rabies, pertussis, influenza, and MMR. In fact, both parties in the Banks case agreed “that the IOM has cited demonstrative evidence of a biologically plausible relation between the measles vaccine and demyelinating diseases such as ADEM,” the Court wrote. Most cases of ADEM (80%) are in children. Symptoms usually appear within a few days to a couple of weeks. They include: headache, delirium, lethargy, seizures, stiff neck, fever, ataxia (incoordination), optic nerve damage, nausea, vomiting, weight loss, irritability and changes in mental status. I know of thousands of parents who witnessed many of these same symptoms afflict their children shortly after vaccination, most typically the MMR. Did these children with autism also suffer initially from ADEM or some subclinical version of the disorder? We may never know (physical signs like myelin damage are transitory). Bailey Banks was given an MRI when his parents brought him to the hospital 16 days after his MMR vaccine, and that helped confirm his diagnosis. The children I know who were brought in with similar symptoms were instead given Tylenol and told to go home. (Interestingly, Tylenol can affect production of glutathione, an essential antioxidant and detoxifier. A preliminary study from UC San Diego showed that children who were given Tylenol after their MMR vaccine were several times more likely to develop autism than other children. “Tylenol and MMR was significantly associated with autistic disorder,” the authors wrote. “More research needs to be completed to confirm the results of this preliminary study.”)…………………………………………………..
Robert Kennedy, Jr. and I would love nothing more than to reassure parents that the nation’s current vaccine program is 100% safe for all kids, and that zero credible evidence has been presented to link vaccines with autism. But that simply isn’t true — as at least two court cases have found. As an Autism Mom, I spent last week with my head spinning. Ultimately though, I could see that the events – in a conflicted American court, a decimated American home and a misguided British newspaper – were all connected, albeit in a deep, unsettling manner. But one that also illuminates that the debate is far from over. 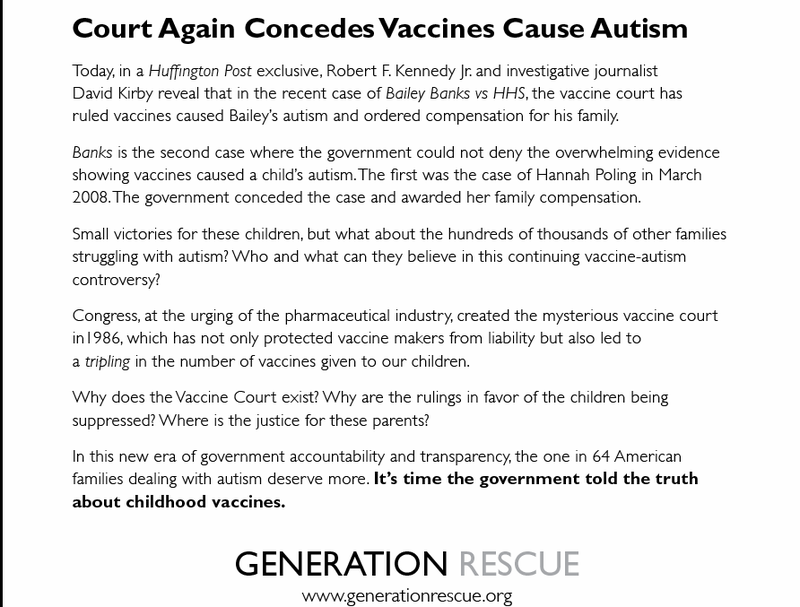 In America last week, our Vaccine Court very curiously threw a hearty dose of cold water over the widely reported connection between autism and vaccines. I use this phrase — widely reported– to emphasize that the connection between autism and vaccines has been spotted by multitudes of front line participants and observers — parents and physicians who have seen children and patients fall apart after being vaccinated. Ignoring these eyewitness accounts is akin to dismissing testimonies from soldiers until those testimonies are “peer reviewed” by scientists who may have no first hand experience in war zones. The Vaccine Court’s decision, like so many complicated matters can be obscured by too much information and, alternately, clarified with a dose of simplicity. So here goes: This year the Vaccine Court, in looking at three specific cases, ruled that, in effect, vaccines and/or their ancillary, toxic ingredients do not cause autism. But last year – with evidence produced by a neurologist father and a mother who is a nurse and an attorney – the court ruled that, in effect vaccines could cause autism. Thousands more cases are pending which it why I believe this matter is far from settled. Ask any bookie: Second guessing an outcome with as many variables as this one is risky business. As this was happening in the United States, in England a journalist reported that a certain gastroenterologist who treats children with autism – and whose license over there is under intense judicial scrutiny — fabricated his data. There are, not surprisingly, counter allegations that the journalist strategically created some of the controversy himself so that his story would get more play. This does not surprise me. As a journalist for more than thirty years myself, I never really believed, even in the pre-blogger days that any journalist was purely objective. Like those scientists about whom I just griped, we all bring some baggage to the table, overt and otherwise. What concerns me more in this case is not the lack of objectivity on the part of that journalist as much as the lack of common sense. After accuracy, common sense is what I emphasize with my college journalism students. You can’t report out any field – be it battlefield or baseball field – without common sense. Here’s how that British journalist let common sense fly out the window in his quest for a sensational story: He questioned the gastroenterologist’s accounts of parents who said their children had adverse reactions to the measles, mumps and rubella vaccination. Those accounts, the journalist wrote, did not jive with the supposedly confidential and protected medical records of other physicians. Well, I had to slap my knee on that one. Did I read this correctly? How many times have any of us been to the doctor and reported symptoms which were never actually written down on medical records either because the recording physician was too busy, too tired – or simply didn’t believe us? That this should be one of the bases of a heralded piece of “investigative reporting” downright astounds me. Probably, it shouldn’t astound me. The history of getting to the bottom of what causes autism has been littered with these lapses of common sense. In coming up with his long-discredited “refrigerator mother” theory Bruno Bettelheim’s researchers asked mothers if they had hugged their babies. The mothers replied that they had tried but the children couldn’t tolerate it; what we now identify as sensory defensiveness and a recognized symptom of autism. The researchers, though, simply noted that these mothers did not hug their babies and from there it was extrapolated that the moms were cold fish who had damaged their offspring. The mothers were sent to see shrinks. The kids were not treated for what ailed them and in many cases sent to Willowbrook or similar hell holes – and the science of autism was delayed for decades. Complicating this British matter even more is the amazing allegation that the gastroenterologist in question, Dr. Andrew Wakefield, single handedly caused the return of measles by writing about his findings on only 12 children, 8 of whom did present with symptoms of autism soon after receiving the vaccine. Yes, there were more cases of measles reported after Dr. Wakefield’s findings were publicized. But some of those children had been vaccinated against measles. And the numbers, heartbreaking though they may be, still paled with the autism epidemic and the heartbreak and yes, the deaths, it has caused. My take on this: Fleet Street made Dr. Wakefield into a hero. And then — because Fleet Street loves to taken away what it bestows, loves the movement inherent in that – it made that physician into a villain. I’d say he is neither. I’d say that Andrew Wakefield is part of a cadre of hard working, well-qualified, learned, physicians and scientists who are responsibly trying to quell the autism epidemic by finding what has caused it. Vaccines are part of what they are exploring. But it is not all they are exploring. Dr. Gordon is in that cadre as is my son’s physician Dr. Michael Elice of Woodbury, New York. Often, these physicians are at odds with the medical establishment, even though they can go mano-to-mano with any number of doctors when it comes to credentials. I think what they’d rather do is find the right medicines to prevent events like the one in Ohio last week. A political science professor from Kent State died after sustaining injuries inflicted by her son with autism. I know many autism parents who have imagined this happening to them. I have. My beloved older son Dan is more than six feet tall and he weights more than 200 pounds. He is glorious in his strength but he is also tortured by his autism. Often, when he was younger, I would speak to him frankly even before a trip to the supermarket. “Dan,” I would say. “We are going to do this and get home alive.” There were times I wasn’t sure if we would. For years Dan was on Haldol, also known as Haloperidol, an anti-psychotic which ultimately can have serious side effects, particularly in the long term. But it was a one of those nightmarish kinds of balancing acts autism parents do all the time. Haldol enabled us to keep Dan living at home; to keep him and the people around him safe. But we knew that we couldn’t, for the sake of his health, keep him on Haldol much longer. In recent weeks, Dr. Elice has helped us to take Dan off of this drug, replacing it with bio-medical interventions that deal with problems in his immune system rather than his brain. After more than a decade on Haldol, Dan is off it and he is sleeping well, going to his work sites – and smiling at his mother. I know that the dead professor’s son smiled at her. I know too that the doctors who are working to find a cure for autism — the doctors whom the powers-that-be love to malign– have these smiles from our kids in mind as a long term goal. I don’t think that is subversive. With the memory of that dead mother in mind, I hope in my heart in soul that the Vaccine Court, in its next ruling, agrees with me and that the court in Britain does as well. What happens in those courtrooms could have a chilling effect on research. Alternately, it could help our doctors to find a cure. When Mr. Kaufman was diagnosed with severe autism, no language, and a tested IQ of less than 30 his parents ignored the statistical evidence and instead developed The Son-Rise Program, which led to his complete recovery from autism. Although vaccines do not cause all autism occurrences, Mr. Kaufman disagrees with those who say that so many parents are making up or imagining a link, and further disagrees with the position that the autism/vaccine link is coincidental. Mr. Kaufman does not support canceling the vaccination program but believes it’s prudent for parents to ensure their child’s vaccines are thimerosal-free, administered separately and not at too early an age — and never when a child is ill.
Autism Treatment Center of America is a non-profit organization that teaches parents to help their children with autism and other developmental challenges. As providers of an educational intervention it has no vested interest in whether vaccines have caused some cases of autism but always stands by parents. Parents know their children and have an ability to help their children that is unparallel. By Kent Heckenlively, Legal Editor for Age of Autism. There’s a line in the movie, “The Right Stuff” in which an astronaut explains to an engineer the truth about funding by saying, “If there’s no bucks, there’s no Buck Rogers” and subsequently no space program. The polite fiction maintained by this court is that those questioning vaccine safety have been listened to and substantial financial resources were directed to researching those claims. Nothing could be further from the truth, and it forms a necessary backdrop to a discussion of the Hazlehurst case. Special Master Patricia Campbell-Smith begins by noting that this trial “does not and cannot offer a determinative explanation” for what causes autism. She then goes onto notes the number of articles submitted and the parade of experts and their qualifications, before finally noting that the government’s witnesses were more persuasive than the witnesses for the families. But this decision was not inevitable. Campbell-Smith notes that “when appropriate, medical opinion and circumstantial evidence is enough to prove causation.” There was abundant medical evidence, including some very powerful testimony from family members and physicians, including a Harvard gastro-enterologist which could have more than sufficed for a favorable decision. One of the staggering examples of the lack of intellectual curiosity in this case is the question of whether mercury exposure in the young might look and cause significantly different problems than in more adult members of the population. While Campbell-Smith does an adequate job of recounting some of the petitioner’s theories on the functioning of the immune system, there seems to be little interest in trying to figure out what has gone wrong with these children. Campbell-Smith’s willful blindness extends to her discussion of how there is “some evidence of a temporal connection” to the MMR shot received by Yates Hazlehurst and his subsequent deterioration. She notes it, but doesn’t seem to be able to go any further with it. Equally indicative of a lack of intellectual rigor is her discussion of Andrew Wakefield’s theories. At one point she mentions how the theory of measles virus persistence of Dr. Andrew Wakefield “continued to attract scrutiny”, when it was subject to vicious attack from the outset. In her discussion of whether Yates suffered from immune system problems, she notes his 8 ear infections and treatment with anti-biotics, his normal development, his gastro-intestinal problems, but seems to be dazzled by the parade of the government’s expert witnesses who can offer no other explanation, other than it couldn’t possibly have been the vaccines. I also find it amazing that certain assertions put forth by the government are not questioned, while straight-forward propositions such as that mercury can affect immune-system function are questioned with the scorn reserved for those who believe 9/11 was an inside job. The government continually talks about autism “genes” but despite millions of dollar spent in this pursuit still can’t find them. And when such genes show “an association” is found, a closer observation inevitably shows those genes to be involved in detoxifying the body of harmful substances. The other day I was staggered to read a press release from Stanford University in which they announced they’d developed a test which might identify those suffering from problems with mitochondrial function. Their answer was to measure glutathione levels. That’s something the biomedical community has been doing for years. But there is a moral dimension to our cause that they can never match. I don’t know how long it will take, but we will someday have the answer that even the medical community’s best and brightest fail to provide us. The Sunday Times last weekend resumed its witch-hunt against Andrew Wakefield, the gastro-enterologist who warned against the possible risks to children of the MMR vaccine following a paper he wrote in the Lancet in 1998. In this paper, he described a new childhood syndrome which he called autistic enterocolitis, which suggested a connection between a new type of bowel disease and autistic spectrum disorder and reported the fact that some of the parents of the children in the study thought there was a connection between these symptoms and the MMR vaccine. The titanic furore which subsequently engulfed Wakefield, in which virtually the entire medical establishment turned on him, effectively forced him out of Britain and has resulted in his being investigated by the General Medical Council for serious misconduct. What the Sunday Times did not report was that the GMC investigation into Wakefield was triggered by a complaint from… Brian Deer, who furnished the allegations against him four years ago. He has thus been reporting upon the hearing into his own complaint. Since when has a reputable paper published a story by a reporter who is actually part of that story himself — without saying so – and who uses information arising from the disciplinary hearing which he himself has instigated and which is investigating allegations he himself made in the first place?……………………………………….. It is of course precisely Wakefield’s concern that the MMR vaccine might, in a small proportion of cases, trigger a catastrophic reaction in a child with an as yet unknown pre-existing vulnerability. For that he is being hung out to dry – and any discussion about his concern is being suppressed by the intimidatory tactic of blaming anyone who says he might have a point for the reported rise in measles cases. As has been said over and over again from the very start, that problem could have been totally avoided if the government had provided single measles jabs. It refused — because it was determined not to concede any ground over multiple vaccines and so decided instead to play for the highest possible stakes in destroying Andrew Wakefield. It is the Department of Health – which never flags up similar concerns about the rise in cases of autistic spectrum disorder — that is responsible for the rise in measles cases. Truly, health policy and a show trial straight out of Kafka. Here is Keith’s script from the February show, where Brian Deer received the bronze Worst Person in the World honors. The bronze to Brian Deer. He wrote the Times of London report that Dr. Andrew Wakefield had allegedly altered key research linking the Measles, Mumps and Rubella triple-vaccine to autism in children, which earned Dr. Wakefield a spot on this list yesterday. The Times of London did not bother to mention that the British investigation into whether or not Wakefield did that was the result of a complaint by… Brian Deer. The guy who wrote the article about the investigation never mentioned he was the complainant who precipitated the investigation. The truth about the doctor’s research may be in doubt here, but not Deer’s vast conflict of interest nor the Times of London’s journalistic malfeasance. January 26, 2009 Autism Action Alert: Click HERE to send your letter! Even as the evidence connecting America’s autism epidemic to vaccines mounts, dead-enders at the Centers for Disease Control (CDC) — many of whom promoted the current vaccine schedule and others with strong ties to the vaccine industry — are trying to delay the day of reckoning by creating questionable studies designed to discredit any potential vaccine-autism link and by derailing authentic studies. On January 12, a cadre of mid-level health bureaucrats left over from the Bush administration ignored Federal requirements for advance notice in order to vote to quietly strip vaccine research studies from funding allocated by Congress in the Combating Autism Act (CAA) of 2006. Members of Congress had said that this money should be used to study the vaccine-autism connection. These rogue bureaucrats — members of the Interagency Autism Coordinating Committee — held an unannounced vote to remove previously approved vaccine studies from funding under the CAA. Nearly all of the “Federal” members of the panel voted to remove the two studies, whose estimated cost was $16 million – or 1.6% of the billion dollars authorized by Congress for autism. The panel’s civilian members, in contrast, voted nearly unanimously to retain the funding. IACC’s action to halt vaccine-autism research flies in the face of congressional intent. The bill’s authors clearly stated that vaccine research should be funded. Even the esteemed Institute of Medicine has condemned CDC’s methods. In 2005, an IOM panel condemned CDC for its “lack of transparency” in vaccine-autism research. Maybe Jeremy Piven didn’t get mercury poisoning from fish at all — according to the results of a new study released by the Institute for Agriculture and Trace Policy (IATP), the actor may well have been sickened by soda or candy or anything that contains high fructose corn syrup, which, if you eat processed food in this country means, well, just about anything. Foodies and nutritionists alike have been griping about high fructose corn syrup for years, and the industry has responded with an “astroturf” campaign and a level of secrecy generally reserved for military officials or secret societies (see Corn Refiners’ Association president Audrae Erickson’s stonewalling performance in King Corn). Of course, I wouldn’t want to show my hand either, if the making of my product could be described as the undertaking of a “small Manhattan Project” (see eye-glazing production info here). But as it turns out, the HFCS industry has been hiding some major skeletons in its closet — according to the IATP study (pdf), over 30% of products containing the substance tested positive for mercury. What makes this news truly shocking is not just that the manufacturers of high fructose corn syrup would put consumers’ health at risk, but that the US Food and Drug Administration (FDA) knew about the mercury in the syrup, and has been sitting on this information since 2005. Here’s the connection, according to the IATP press release (pdf): The IATP study comes on the heels of another study, conducted in 2005 but only recently published by the scientific journal, Environmental Health, which revealed that nearly 50 percent of commercial HFCS samples tested positive for the heavy metal. Renee Dufault, who was working for the FDA at the time, was among the 2005 study’s authors. In spite of Dufault’s involvement in the study, the FDA sat silent on this one for three years, and in fact last August, allowed manufacturers to call the sweetener “natural.”………………………………………….. Most of the time, in the countless articles and news videos I look at, the controversy over vaccines and autism is presented as a debate with scientists and doctors on one side and parents along with the general population on the other side. We rarely hear about the experts who challenge the claims of health officials. This is a point of increasing frustration for me and countless others in the autism community. This isn’t just an argument about proving vaccines have serious side effects. It’s really about who will be held responsible if it’s clearly shown that through complete oversight failure, a generation of children has been damaged by unsafe vaccines. That’s it—pure and simple. But we don’t talk about that. We pretend that autism is a puzzle we just haven’t been able to solve and that officials have earnestly looked for a link with vaccines, but they keep coming up empty. Late last week, I received word from Linda Weinmaster of No Mercury that Dr. Frank Engley had died. Dr. Engley has an extremely important place in the story of the autism epidemic and he’ll be long-remembered for what he did to expose the truth. 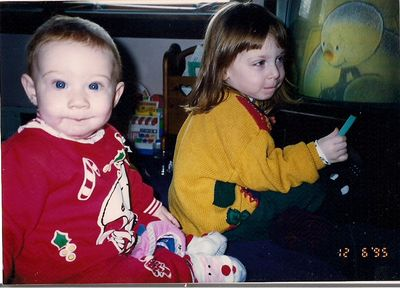 Reporter Ashley Reynolds interviewed Dr. Engley as part of her incredible landmark series, Combating Autism from Within, on KOMU-TV in Columbia, MO in 2007. His comments deserve to be acknowledged now. You can listen to him explain how officials ignored the recommendation to remove the mercury-based preservative thimerosal from medical products, especially children’s vaccines, back in the 1980s and about the fear that motives them now. A while ago I learned the term “iatrogenic” and simply put, it’s an adjective that means “caused by doctor.” It’s used to describe a symptom or illness brought on unintentionally by something that a doctor does or says. I’m sure it’s a word that sends shockwaves through the medical community. Dr. Engley’s comments make it clear that autism is an iatrogenic epidemic. Dr. Engley was a researcher and microbiologist who served on boards with the Centers for Disease Control, the FDA, and EPA throughout the 1970s and 80s. He researched the toxicity of thimerosal. He understood that there’s no such thing as “safe mercury” and he knew of the potential for harm from continued mercury use. “I am afraid they [the FDA] have a tremendous amount of pressure being brought to bear by the medical profession, by the pediatricians, by Congress, and by industry, and so they are under pressure and someday they will have to live with the fact with what they said is wrong,” said Dr. Engley. He noted that the FDA knew about the dangers of thimerosal back at the time when he served on its board. “I would say to you, the FDA is partly to blame for the mecuricals still being on the market all that length of time. If they would have followed through with our 1982 report, vaccines would have been freed of thimerosal and all this autism as they tell me would not have occurred. But as it is, it all occurred,” said Dr. Engley. The date of 1982 has a chilling effect on me as a parent and I’m sure others share my thought: “If they had listened in 1982, my child wouldn’t have autism.” They were warned by a top scientist and one of their own board members and they did nothing. They allowed the drug industry to continue to expose our children to more and more deadly mercury and they pretended it was safe. Dr. Engley may not have seen the truth officially recognized in his lifetime, but it’s coming. There are too many voices out there all saying the same thing. There is an epidemic number of disabled children who can’t be explained away. The tired old claims from the CDC and medical organizations are falling on deaf ears. The public is going to be left with a welfare disaster when it comes time to support a generation of adults with autism who aren’t there now. They will demand to know the truth about what happened and Dr. Engley gave us that truth. CDC Director Dr. Julie Gerberding has delivered a potentially explosive report to the powerful House Appropriations Committee, in which she admits to a startling string of errors in the design and methods used in the CDC’s landmark 2003 study that found no link between mercury in vaccines and autism, ADHD, speech delay or tics. Gerberding was responding to a 2006 report from the National Institute of Environmental Health Sciences (NIEHS), which concluded that the CDC’s flagship thimerosal safety study was riddled with “several areas of weaknesses” that combined to “reduce the usefulness” of the study. “CDC concurs,” Dr. Gerberding wrote in an undated mea culpa to Congress, (provided to me through a Capital Hill staffer) adding that her agency “does not plan to use” the database in question, the Vaccine Safety Datalink, (VSD) for any future “ecological studies” of autism. Ecological vaccine studies are large, epidemiological analyses of risks and trends using computerized data from large populations — in this case children enrolled at several big HMOs — without ever examining a single patient in person. There is nothing about this on their site. Fantastic Government we have, is it not?! WASHINGTON, DC – A newly published study in the Journal of the Neurological Sciences , the official journal of the World Federation of Neurology , links mercury from the Thimerosal in vaccines with autism and other neurodevelopmental disorders. Nonetheless, this new analysis of some of the data in the carefully guarded VSD database, documenting the mercury poisoning of a generation of American children, would never have been possible without the intervention of Congressional leaders, parent autism advocacy groups, and legal experts. Ironically, only a few independent researchers have gained even this limited level of restricted access to the VSD database, despite the fact that the VSD Project is funded by hundreds of millions of taxpayer dollars. The new study, led by Dr. Heather Young, Ph.D., a professor of epidemiology at the George Washington University School of Public Health and Health Services, examined the CDC-supplied medical vaccination records from the VSD of 278,624 children, born from 1990 through 1996. This study calculated the average mercury exposure children incurred from routine childhood Thimerosal-containing vaccines, by year of birth, during their first year of life. After calculating average mercury exposure by year of birth, the study then estimated the prevalence rates of various medical diagnoses for children born in each of the years examined. The prevalence rate of autism and other neurodevelopmental disorders correlated with the average mercury exposure children received: increasing/decreasing levels of mercury exposure from routine childhood Thimerosal-containing vaccines resulted in corresponding trends in prevalence rates of these diagnoses. By contrast, medical outcomes presumed to be unrelated to mercury exposure did not correlate with the average levels of mercury exposure from routine childhood Thimerosal-containing vaccines. Well I am sorry for the childen afflicted with any form of autism, it yet is a medical issue that needs to look at all contributing factors or the suggestions of them. The first one investigation is to ask all parents do they know when each one of their children had their umbilical cord tied off, hand-squeezed off, or clamped off. The faster the clamping off the infusion of the blood the more likely the baby was anemic and at the time if his/her first injection of stuff with mercury in it. That was likely the Heb. B injection of an STD. The baby was not risk of being sexully active at the time the disease was injected into their blood stream, an adult’s dosage at that. This shot would be given regardless that the baby was testable anemic. Then the shots continjue, thereafter, every time the child is taken to the doctors, the next injection being about one month later after his/her birth, yet getting over an medically caused anemic condition. The parents ought to be asking why they were asked to sign a waiver of where the tissues were discarded, like the placenta, its contents, the membrane and the cord. All are discarded by practical use by the institution where the birth took place by selling it to drug corporation, cosmetic corporations, blood banks, tissue banks where skin is cloned, like foreskin tissues or the placenta membrane. When the groups look at anemic conditions requiring a blood test, they do not associate a well looking baby (no disfiguration) of being caused a compromised situation when injected of stuff. They do not know their baby is anemic in the first place. Not all children are vaccinated who have some form of autism, mild to severe but the common cause if an investigation were to be taken will reveal early umbilical cord clamping is one common factor. The next common factor will be a blood test, they are anemic, and may be so, yet by the time they are teenagers. This is the best covered-up hidden cause since 1801, weaker children, exploited for their placenta blood because most do live, but many are then mentally impaired; as well some are physically impaired with various degrees of CP. Go criminal against the medical corporation, societies, federations that directed a teaching policy, protocol, bulletin to impose early cord clamping. That is what causes weaker infants everything is then added to this problem. That will be true of the addicts’ children, too, or to the child born with the Down Sysdrome. All add more to the burden of care when the doctors choose which of their patient’s children will donate to their causes, blood. They seek the baby’s blood for community use, sold for profits and collector’s fees. Midwives are often in on the collection fees, and lie just as good as any other medical person aiding in a child’s birth.